20 iron metal discs. 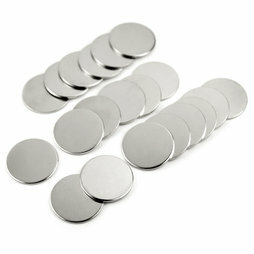 The metal discs are not magnetic, but a magnet adheres very well to these metal discs. The discs are nickel-plated so they won't rust. Suitable for experiments with magnets. Each disc has a diameter of 35 mm and is 2 mm thick (+/- 0.1 mm) and weighs about 15 g. When you purchase a set you will receive 20 metal discs in a plastic pouch. You see how the magnetic field of the S-20-10-R 'transmits' through the metal discs and makes them also magnetic. In the midst of this metal disc jungle hides a K-26-C. The metal discs make the magnetic field lines visible and tangible and encourage to discover magnetic force in a playful way.